This low-cost BDM pod resembles a USB memory stick in size and shape, and is USB 2.0-compliant. It is based on the open-source USBDM project featured in the Freescale Community Projects Forum, and supports S08, S12, S12X, S12Z, and ColdeFire V1 core targets, via a standard 6-pin BDM cable. It is fully compatible with CodeWarrior and NoICE, once you have installed the relevant DLLs. Power is derived from the host USB port, which can also power the target board at a jumper-selectable 3V or 5V, if desired. Even if you aren't using CodeWarrior, this is a very useful pod. The host software includes standalone programmers. A Linux version of the software is also included in the USBDM project (click on Product Use tab for a link). Click on the latest version folder (e.g. Version 4.12.1), then click on the Drivers folder and download the USBDM_Drivers msi file for the OS you are using (the first two are for WinXP only; the others are for Win7 and higher). Run it to install the drivers on your system. Then go back up one directory level, click on the Software folder, download the actual application for your OS (e.g. USBDM_4_12_1_140_Win.msi) and install it on your system. Note: If you plan to use CodeWarrior, we recommend that you install CodeWarrior first, before installing the USBDM application. Plug USBDMLT into an available USB port. The first time you do so, you'll need to wait while Windows installs the necessary driver for that port. Use the Windows Start feature to select the utility you want to run. Usually, it would be the 9S08 programmer, the HCS12 programmer, or possibly the firmware updater. Note that you can't use USBDMLT with CF v2, 3, or 4, DSC, RS08, or ARM. If you have an earlier version of USBDMLT and want to update its firmware, run the FirmwareUpdater and check the AutoUpdate box. Then click Program and follow the prompts. Follow the instructions to complete the update. If you are using CodeWarrior, the USBDM pod should show up in the list of connection types for the debugger. If not, select TBDML. The standalone programming utilities are great for use in a production environment, where you don't have or need a CodeWarrior installation. For example, HCS12_FlashProgrammer can be used to erase/flash/verify a .sx file in a target board, all in one automated sequence-- just click "Yes" to program another. 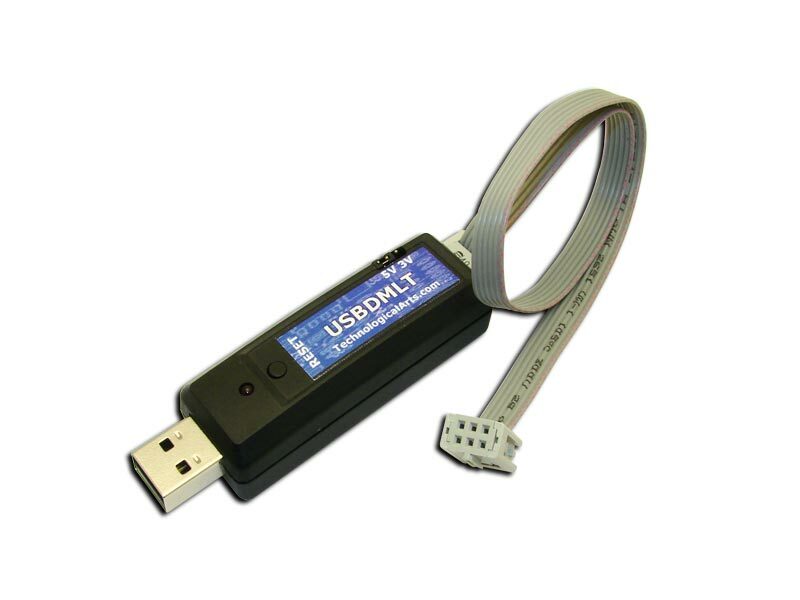 USBDMLT is the best value in 9S12 programmers around.